It is replaced by the Motorola MC75A. The Motorola MC75 redefines the standard for EDA mobile computers by packing an unprecedented number of enterprise-class features into a single device. 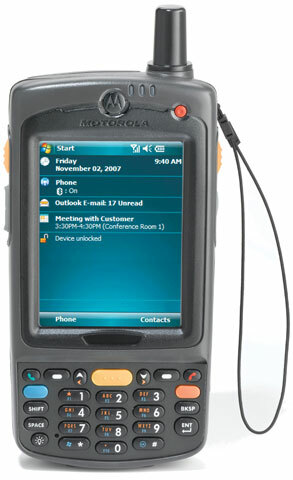 The MC75 includes a 3-G world cell phone, integrated GPS, walkie-talkie, 1D and 2D barcode scanner, 2 mega pixel auto focus camera with flash, mobile computer, and wireless LAN (WLAN), wireless PAN (WPAN) and IrDA connectivity. The robust bandwidth of 3-G combined with the latest mobile computing platform provides the MC75 with the maximum processing power required to handle virtually any business application, maximizing workforce efficiency with simultaneous anywhere, anytime mobile voice and data. MC75 Complete Kit, Starter kit bundle for MC7598-PZHSKQWA9WR that includes the PDT and all starter accessories. MC75 Complete Kit, Starter kit bundle for MC7598-PZGSKQWA9WR that includes the PDT and all starter accessories. MC75 Complete Kit, Starter kit bundle for MC7598-PZFSKRWA9WR that includes the PDT and all starter accessories. MC75 Complete Kit, Starter kit bundle for MC7598-PZFSKQWA9WR that includes the PDT and all starter accessories. MC75 Complete Kit, Starter kit bundle for MC7598-PZESKRWA9WR that includes the PDT and all starter accessories. 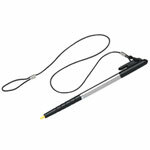 MC75 Complete Kit, Starter kit bundle for MC7598-PZESKQWA9WR that includes the PDT and all starter accessories. MC75 Complete Kit, Starter kit bundle for MC7598-PYHSKRWA9WR that includes the PDT and all starter accessories. MC75 Complete Kit, Starter kit bundle for MC7598-PYGSKRWA9WR that includes the PDT and all starter accessories. MC75 Complete Kit, Starter kit bundle for MC7598-PYGSKQWA9WR that includes the PDT and all starter accessories.